Now and again, the occasion calls for a dinner party. For centuries, dining has been an essential part of socialising. But culinary trends have changed hugely. So, how do we dress our dining tables and create the right ambience for both formal and casual dinner parties? There are differences between formal and casual dining events and how you can set the perfect tone and table for your next dinner party — whether it’s a formal or informal affair. What is a formal table setting? 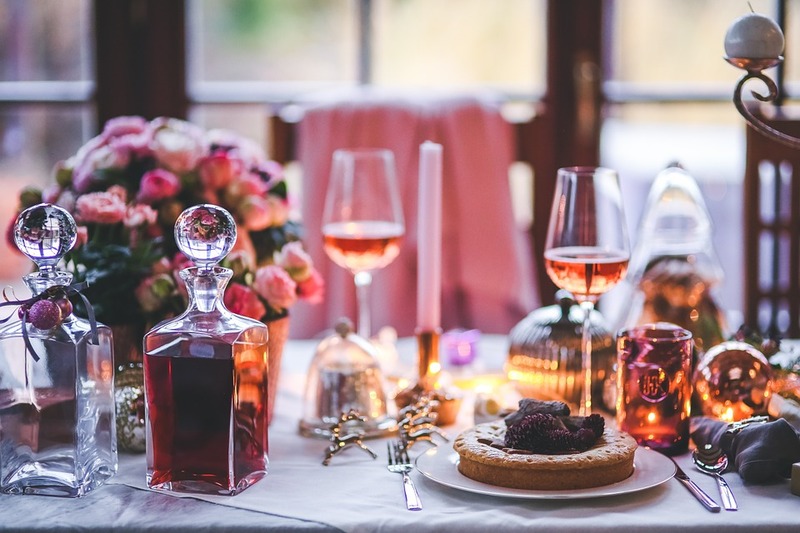 When you’re celebrating a special family occasion, or just inviting your boss over or even reuniting with long-lost friends, you might want to opt for a formal table setting to mark the event. A formal table will have pre-set cloth napkins — and potentially antique silverware and glassware — as well as a quality tablecloth and an elaborate centrepiece. Candelabras, sterling silver wine ewers and antique claret jugs are also great if you want to set an elegant dining tone. Traditionally, at a formal dinner party, each guest would be given an empty plate for each course. A server would bring the food in and offer it to each person individually, rather than placing plated-up food on the table. To be honest, this practice is old-fashioned, and you might just prefer to serve your guests already-filled plates and bowls for each course. If you’re hosting a formal dinner party, preparing up to six courses is a pretty much-accepted rule. Courses will often include a starter, fish course, meat course, dessert, and cheese. What is an informal table setting? This could be anything! A family dinner to a casual get-together with friends. The whole ambience should be more relaxed and there’s no need to use your finest china and silverware! But that doesn’t mean your table shouldn’t look good and you could still use attractive centrepieces — such as an LED vase or decorative wooden bowl for example. An informal table setting features minimal flatware and cutlery. You can simply place all your food (when it’s cooked!) on the table for your guests to help themselves. An informal dinner party can also consist of a single course or the standard three-course affair. It’s a good plan to either go for the typical ‘starter, main and dessert’, or just rustle up a good hearty main meal and allow your guests chat, laugh and drink as they enjoy their dinner. When setting a formal dinner table it’s really important that you place your cutlery correctly. Start by placing your dinner plate in the centre with all forks to the left of it, and knives and spoons to the right. The dessert fork and spoon must be above the plate — the fork below the spoon — with the former pointing to the right and the latter, to the left. All side plates should be to the left of your dinner plate, and napkins go on the side plate. You can also put your napkins on each dinner plate if you prefer. All cutlery must be placed in the order it will be used — starting from the outside and working in. Knife blades should face the plate and all fork prongs must face the ceiling. If you’re serving salad and soup, the salad must be served on a salad plate, which is placed on top of the dinner plate. The soup bowl then goes on top. If you’re serving red and white wine, they must be served in separate glasses. These should sit above the table knife, on the right-hand side. Everything your guests need to dine should be on the table and it’s essential to ensure that each dish is cleared after each course. An informal dinner party gives more opportunity for creativity and isn’t as restricted by rules, particularly in terms of how your table is presented and the food is served. But you definitely still want to create an attractive setting. How about starting off with a theme? Whether this is simply a colour, or you want to go for something a bit more quirky, such as the seaside. Whatever look you go for, a theme can really bring your informal dinner party to life. Get tablecloths and runners that complement your theme and place handmade crafts on the table to add a bit of character. You could also slightly change formal table setting trends to make them more look more casual. A few ideas come to mind, like wine corks, toothpicks and paper to make fun place card holders for each guest or colourful, simple tealights to brighten up the table. Many dinner party hosts also serve food that’s more interactive so as to make the meal less formal. Fajitas or gourmet burgers that people can place their own toppings on, for example, can be really impressive and create a more relaxed feel. Try putting everything on the table at the same so that your guests can pick and choose which ingredients they want to eat and pass food around. This will definitely create a laid back and friendly atmosphere. Hosting a dinner party is exciting! Keep that in mind, even when the planning is stressing you out! Simply decide how formal or casual you want the evening to be and use the right tableware and dining etiquette to set the tone you’re opting for!